Please check out our Modular Wall Plate Section for similar products!!!! 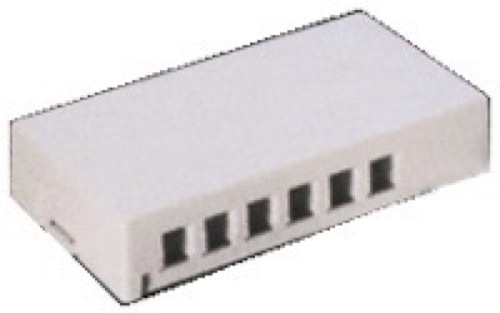 This surface mounted platform accepts all QuickPort snap-in modules used for audio, video, and telecommunications. It can be mounted to almost any surface or location. Observe the locations of the cable access holes on the side. Find the location where you want to mount the jack. Remove the cover of the surface mount jack assembly using a flat blade screwdriver. Run you cables to the location of the surface mount jack assembly. Attach the base to the wall. Attach connectors, jacks and modules to your cables. Snap the jacks and modules into the base of the surface mount jack assembly. Snap the cover of the surface mount jack assembly onto the base.